Mr. President & The First Lady’s Two Eggs Are Soon Due to Hatch at National Arboretum on DC Eagle Cam! 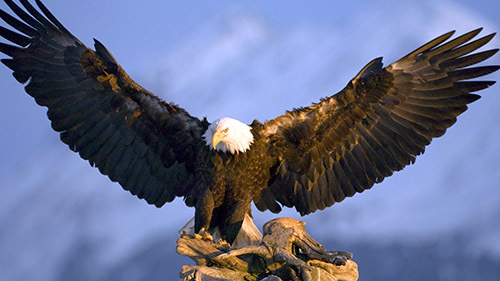 WASHINGTON–The millions of viewers who have become addicted to watching bald eagles “Mr. President” and “The First Lady” on the DC Eagle Cam (dceaglecam.org) may want to keep their eyes glued to their computer screens beginning this weekend to hopefully see two fuzzy eaglets emerge from their eggs. The first egg was laid on February 19 and the second was laid on February 23. Because the average incubation period for an eagle egg is 35 days, the American Eagle Foundation expects the first eaglet to begin hatching around Sunday, March 26 with the second beginning to hatch around March 30. This is just an estimate, however, and may vary by a day or two. Each eaglet has an “egg-tooth” on the tip of its upper beak, which is used to crack holes in its eggshell from the inside. The first hole made in the shell is called a “pip.” It sometimes takes up to 24-48 hours for an eaglet to fully emerge from its shell after the first pip. Once hatched, these two eaglets will (for now) be called DC4 and DC5, as these will be the fourth and fifth eaglets raised in this nest located at the top of a Tulip Poplar Tree in the U.S. National Arboretum in Washington, DC. Last year, the cams were viewed more than 10 million times during the several-day hatch period of eaglets, DC2 & DC3. Viewers who think they can guess the exact day and time that the eggs will hatch should hashtag #dceaglecam on Twitter, Facebook, and Instagram with their prediction (Eastern Standard Time). AEF Announces 2017 Grant Winners “Breaking” News: DC Egg Begins to Hatch!